Which 110V MIG welder is best for the money? Spool gun can be added for aluminum welding. Has a durable metal drive/feed. Ever wanted to fast-forward the highlights in an ESPN telecast just to know the final score of the game? Then you probably want to know already which product is the best choice out of this review. 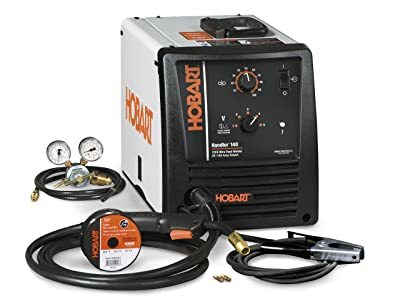 Well, it is my opinion that you will not find a better MIG welder for its price tag than the Hobart 500559 Handler Wire Welder.This machine is durable, compact, performs outstandingly and is an excellent value for the money. The Hobart welder meets or exceeds the needs of today’s do-it-yourself hobbyist. Its drive system of cast aluminum and work clamp helps this machine to deliver the excellent performance of professional quality. With industrial strength, multi-functionality and handy features, this 115v machine can handle any number of welding demands. The product comes out of the box practically ready for use with minimal setup necessary. Fully adjustable drive system reduces wire tangle and crushing. Tested manufacturer. Come's with FREE spool gun for aluminum welding. It comes MIG ready with regulator and gas hose. Below are some of the best MIG welder reviews and important information about the most popular brands and models of MIG welders in the industry. These reviews should help you choose the best welding unit for your needs. Keep in mind that all MIG welders essentially perform the same function. What separates each product is its application and additional manufacturer features and components. 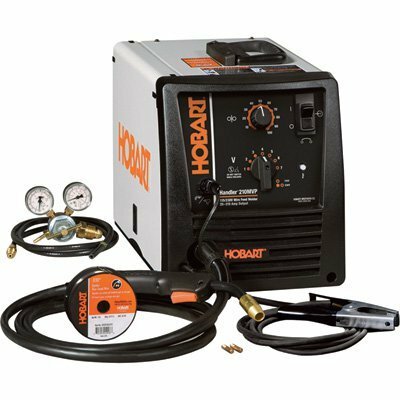 The Hobart 559 Handler Wire Welder, also known as the Hobart handler 140, is a MIG welder with high task yield and incredible power. It is compact and portable. It operates on 115V household power and delivers 140 amps output power. The Hobart Handler 140 does not need additional setup and is ideal for steel, stainless alloys, and aluminum. This 110v machine has a flux core capacity that makes it capable of working thick gauge steel – even 24-gauge up to ¼ in thick materials. The machine is perfect for DIY repairs, basic metal welding, construction jobs and auto body repairs. The Handler 140 is built to be durable. It is Hobart’s most popular MIG welder. It is also the industry’s best model for the value. It is extremely versatile. It is perfect for the welder in an auto body, farm projects, and household repairs.With a 5-position tapped voltage control, this 115v welding machine allows you the ability to select how tuned you want your arc. It has a heavy-duty work clamp and gives an industrial performance. For a more extensive review about this Hobart Handler click here. Processes: Flux Cored (FCAW) MIG (GMAW). Material Thickness: Mild Steel – 24 ga. – 1/4 in. Weldable Materials: Steel, Stainless Steel, Aluminum with Spool gun. Input Voltage: 110/115/120 V, 60 Hz . Rated Output: 90 A @ 20% duty cycle. Amperage Range: 25 A – 140 A. Wire Feed Speed: 40 IPM – 700 IPM . K2185-1 can be plugged into a standard 20-amp outlet. Although gas is essential for function, it can work without gas as well. Flux core welding makes use of a hollow wire electrode that gets fed through the gun. This welding machine is compact, lightweight, and portable. It has four settings for voltage a speed adjustment that allows to weld from 24-gauge to 1/8” thick metal. It comes with everything you need for MIG welding in the box. It comes with a cable assembly, gun, clamp and work cable, gas regulator, hose, and gas nozzle, solid wire spool, contact tips and hand shield with filtering lens and plate. The only left to do is add the protective gas. Material Thickness: Mild Steel welds up to 1/8 in. Rated Output: 70A/17V/20% duty cycle. Wire Feed Speed: 0-300 ipm. Welds only Low Carbon Steel up to 1/8”. It requires 120v for input and gives 125 amp out. It is suitable for home and garage welding. The Forney 299 125FC Flux Core welding machine comes with handles and allows for 2 and 10 lb. wire spools. It can be used anywhere. It is packed in torch wrap – making it easy to take off and on. It is perfect as a starter welder. It works without having to use a gas set up. Processes: Flux Cored (FCAW), (Gas-less/flux-core welding only). Material Thickness: Plate thickness, 24 gauge up to 1/4″. Rated Output: 125 AMP output. Amperage Range: 20 – 125 AMP output. Wire Feed Speed: not specified. There is a knob from 1 to 10. Wire loads easily and quickly. The Longevity has a proprietary transformer technology and comes with a thermal overload protection to prevent overheating. It is 140 amp MIG. It allows for easy interchange of torching with a spool gun. The machine can handle up to 11 lbs. of the spool. It connects to any 110V wall outlet. There is a power plug installed on the equipment. It has the capacity to weld up to 3/8” of Low Carbon Steel. The unit operates on gas or can function using flux-core welding. The Longevity is portable and can be plugged and used anywhere. It is perfect the shop or home. Material Thickness: 24 ga – 1/4” Steel. Rated Output: 20% @ 90A 18V duty cycle. Amperage Range: up to 140A. Wire Range:.025”-.030” (0.6-0.8mm) solid steel, .030”-.035” (0.8-0.9mm) Flux-Cored. These are the best MIG welder reviews for the rigs with a little more power in them. 220v models are usually more expensive but much more powerful. They can prove quite useful if you regularly weld ticker steel up to 1/8’ or aluminum. With these machines you have more room to grow into your hobby or profession. Some of these best MIG welding machines come as dual voltage machines (110V/220V) making them mobile and diverse. With the 210 MVP, you can use either the 115V or 230V power input. It does not require additional tools to connect to the power receptacles. It has a multi-voltage plug that makes it easy to connect and use the welder anywhere. Using with an instruction guide is easy. It is perfect for beginners or professionals. The 210 MVP MIG Welder has a powerful output to deal with 3/8 in. mild steel and good enough control for 24 gauge. It is easy to connect the optional SpoolRunner spool gun. It can be used for applications of mild or stainless steel. The welding machine has seven output voltage settings and speed control. Processes: Flux Cored (FCAW), MIG (GMAW). Material Thickness: Mild Steel – 1/4 in. to 3/8 in. Rated Output: 115 V, 90A @ 20%, 230V, 150A @ 30%. Wire Feed Speed: 40 IPM – 770 IPM. Power MIG 210 Mp is versatile and has strong sheet-metal construction. It is ideal for most jobs in the home or a small shop. It can be plugged into any conventional power supply. It has dual voltage inputs of 120V or 230V. It has excellent arc action with diamond core technology. It has an easy-turn numeric drive that indicates if there is any tension present in the unit. 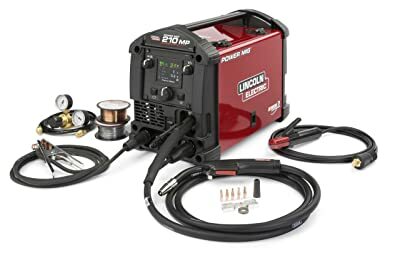 The Lincoln is ideal for beginners and those who are getting into welding for the first time. The display is easy to operate and simple to set up. This multi-functional MIG welder can also be used as a stick or Tig welding machine. 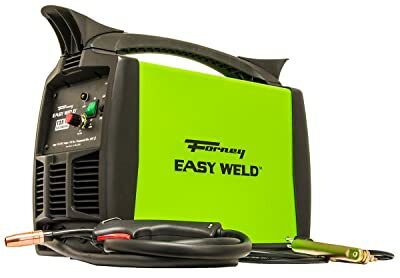 It’s also got many positive MIG welder reviews by Tig welders on welding forums, so if you ever choose to Tig weld something or you just want to learn Tig welding this is the right rig for you. Processes: MIG, Flux-Cored, DC Stick, DC TIG. 1. MIG: Weld up to 5/16 in. mild or stainless steel or aluminum* up to 3/16 in. 2. Flux-Cored (Self- and Gas-shielded): Tackle the biggest jobs. 3. DC Stick: Handles up to 5/32 in. stick electrodes. 4. DC TIG: Enabled by Touch Start TIG® technology. Rated Output: 120V: 100A/19.0/40%, 230V: 200A/24V/25%. Amperage Range: 120V: 20-140 Amps DC, Max. OCV : 56, 230V: 20-220 Amps DC, Max. OCV : 56. Wire Feed Speed: 50-500 ipm (1.3-12.7 m/min). 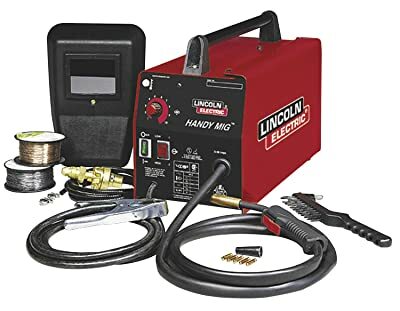 The Lincoln MIG welder comes with the regulator, gun, wire spool and other accouterments. The standard gun is replaceable with a Magnum 100SG spool-gun. Cast aluminum gives a smooth flow of wire throughout. There are 180 amps to heat almost any job. It is versatile and uses an assortment of wire thickness for light fabrication and maintenance and repair. MIG weld 24 gauge up to 3/16 in (4.8 mm). Weld up to 1/2 in. (12.7 mm) steel using self-shielded Lincoln Electric Innershield® (FCAW-S) wires. Rated Output: 208: 130A/17V/30%, 230: 130A/20V/30%. Portable at only 66 lbs. You have to purchase a separate cullet and body if the MIG contains 1/16”, 0/040” or 0.20” electrodes. The machine has excellent weld penetration with a wire feed motor system that functions well. It has a 30% duty cycle. It weighs 85 lbs. It can connect to a 200 to 220V wall outlet and can be set up in ten minutes. Its transformer technology has been proven to be reliable and durable. A spool-gun is added to the package at no additional charge. Material Thickness: 18 Gauge –1/4″ Alu. 1/8” Plate or Thicker. Input Voltage: Weld up to 1/2 in. (12.7 mm) steel using self-shielded Lincoln Electric Innershield® (FCAW-S) wires. Rated Output: 1. 20% @175A, 2. 30% @135A Duty cycle. Wire Feed Speed: 50-400 ipm. The Hobart Ironman 230 can be used in a farm or garden and household repair. It operates with 230V input power. The product comes with reversible drive rolls to limit the amount of money spent on replacement parts. The Ironman 230 also comes with controlled infinite wire speed. It has a thermal overload protection that controls and keeps it from overheating. Material Thickness: Mild Steel 24 GA. (0.8 mm) – 1/2 in. Amperage Range: 30 A – 250 A. Wire Feed Speed: 0 IPM – 700 IPM. The Forney 318 comes with a 10’ welding torch, 15’ power cord, regulator, gas hose, and ground clamp. Its input range is up to 190/230V. It can be used on cast iron, Inox,Low Carbon Steel, and aluminum. The wire feeder is the cast-aluminum drive system. It allows it to last longer and weld heavy-duty materials. It welds metal up to 3/8” and there is a gas hose and flow-meter included with the unit.The product is versatile being able to process MIG and flux-core. Tweco consumables are compatible and it comes with a Euro-connect MIG gun. The spool-gun is 20-ft. in length and is ideal for aluminum wire. It has an integrated gas line and gives the user almost unlimited freedom during welding. Material Thickness: 24 ga. – 3/8″. Rated Output: 120A @ 25% Duty Cycle. Wire Diameter Range: 024″ – .035″. Have new, improved and upgraded functions. If you are looking a quick and simple spool gun, then the Spool-runner is your best option. When using the gun, simply plug the lead directly into the feed head. You’ll then attach the trigger lead, and then turn on the spool- gun switch, and you’re ready to go.The Spool-runner can be used for aluminum welds as well as other similar types of metal such as Inox.It is top of the line best welding equipment from Hobart. In MIG welding an electrode or steel wire cylinder(MIG wire) is fed from the welder through a liner and out of a contact tip that is in the machine’s gun. The welder uses power to heat up and melt the wire so that it can be used as an adhesive. Inert gas is integrated into the metal liquid to protect the liquid from infusing with any other atmospheric substances. Using the melted electrode, two metal pieces can be joined as they pass through the welding gun. This process is far quicker than the traditional arc methods that required the use of welding rods. The simplicity of the operation allows users at different skill levels to utilize the tool for a wide range of welding jobs. If you want to read longer version about these and other processes jump to types of welding article. Shielding gases, A.K.A, inert gases, are utilized during the gas metal arc welding (GMAW MIG welding) or gas tungsten arc welding (GTAW tig welders) process. The reason welders use gases is to ensure that oxygen or vapor does permeate the work area. Although the gases inhibit the presence of oxygen, it can also create a poor weld if not used correctly. The key is to choose the right type and amount of gas for the work you are doing. Shielding gas can also be expensive. Before you purchase shielding gas, make sure to do your homework in order to find a type of gas that is both highly-effective, weed-friendly, and cost-effective. To use MIG welders for Flux Cored Arc Welding (gasless welding), it requires changing the polarity switch near the drive to alternate from a solid wire(MIG wire) to flux cored wire. In the case of gasless MIG welder, the flux core wire separates the weld pool from oxygen. A self-shielding tubular flux-cored wire can be utilized to remove oxygen by eliminating the weld pools reliance on atmospheric gas. There are several benefits to gasless welding. First, the welder can be used in any position or in any environment since there is protection from the atmospheric gasses mainly oxygen built into the MIG wire. Second, since no outside protective gas is needed, then it is a more cost-effective and efficient means of welding. Third, it is perfect for beginners since it requires less skill to operate the machinery. Last, flux cored arc welding produces welds with little to no porosity. It creates a solid mass form throughout the weld. One of the first things you want to consider when buying a MIG welder is the output power. For home projects, using thin metals, 100 amps will be sufficient. A rig that has a maximum 140 amps is good to have because you will never know if you will need to weld some things that are thicker. It may cost you a few extra dollars more, but it will be worth it. The minimum power output is another thing to look at when considering a wire fed welder. For 18-gauge metal, a welding machine with a minimum of around 30 amps is just fine. However, if you are going to weld fragile metal that is around 22 gauge or 0.8 mm, then you want to look for a machine with a minimum out of 20-25 amps. Probably, just as important as power is the unit’s feed rate. The feed speed has to do with the speed at which the MIG wire gets fed from the machine to the gun. If it is too slow, the wire will disappear the second it comes into contact with the metal – creating an ugly, uneven weld. If the speed is too fast, the cord will reach out from the gun and leave you with a ton of spatter. When there is a continuous arc, the wire is going just fast enough. If there is a separate setting for power and speed, then chances are you will have to play around with scraps first to find the correct setting. The leading MIG welder will come with an automatic speed setting that will adjust the rate to the relative power. If you have to make small tweaks, there is usually a manual override available. The use of thin wire like .023 or .030 in. will prevent burning through on light materials. The use of thick MIG wire, such as .045 in., will allow for superior fusion when using more abundant metals. The two most common wire types are ER70S-3 and ER70S-6. The ER70S-3 is perfect for welding purposes of all kinds. Whereas, the ER70S-6 wire is typically for use on dirty and rusty surfaces when more deoxidizers are necessary. The wire size that will be utilized for welding will not determine the type of machine you would want to purchase, but the device will play a part in determining the size and type of wire you will use for welding. Performance is most important when choosing a metal inert gas welder, but you want to consider size if you have a limited space and to avoid carrying around a giant machine. Welders can range in size from 40 lbs. to several hundred pounds. It depends on the features and power. The portability needs depend greatly on the kind of welding you will need to accomplish. If you have to move the welder around a great deal, there are carts available that make things a little easier. In the case where the welding machine will be used for auto body work, the cart is ideal for moving around the car smoothly. When you go to purchase your welder, you want to know your requirements well. Knowing what to look for will ensure you are making a wise investment. Remember to think about what you will regularly be welding. You want to buy a best MIG welder that has enough power for the jobs you need. More power will cost you more, but it is worth it than having to deal with a welder that is under-powered. Also, try to keep in mind how much you are willing to spend beforehand because it can be easy to get carried away with the different features. In the article above, I have explained the basics of MIG welding machines. I hope this article has answered any questions you might have had relating to GMA welding. If you like what you have read in this article, take a second and share the post or leave a comment.